Before today's business, a correction. Last Monday was Victoria Day in Canada and for some reason I got it into my head that it was also Memorial Day in the States. Of course today is Memorial Day. My apologies. Canada's Minister of Finance was thinking out loud the other day. Which tells us Canadians he can be a thoughtful person. Who knew? He was ruminating on the future of the Canadian penny. Yeah that's right, the bane of my tailor's existence - the guy that has to sew my damaged pockets because I carry too much change around. Jim Flaherty says Canadians hoard pennies. Well, yeah. For most of us we keep them in jars at home rather than our pockets or purses. 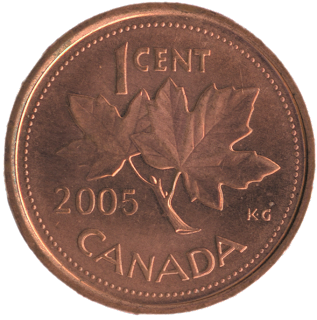 Apparently there are about 30 billion pennies in circulation in Canada but the Royal Canadian Mint has to put about 500 million new pennies into circulation each year - at a cost of 1.5 cents each - because so many end up in those jars, or in fountains, or down between the sofa cushions. Now I for one am in favour of less change in my pocket: pennies, nickels, dimes, quarters, loonies and toonies. But there are two sides to this coin, er, ah, controversy. I don't know if anyone else has thought of this but getting rid of the penny will change our entire culture. It'll no longer be "a penny for your thoughts". It might be a loonie, and who's to say your thoughts are worth that much. Besides, at that price who can afford to know! And fewer people will be able to get "in" now. It'll likely be "in for a toonie, in for a pound." Sheesh, I think I preferred owing a cent rather than two bucks. And what will "it" be worth now? It used to be worth every penny. With inflation it's probably "worth every quarter" now. And if a penny saved was a penny earned, what will it be now, if it's discontinued, worthless? Penny wise was often pound foolish. Now it would be just stupid to be wise about something that doesn't exist. At least now a bad penny will never come back. 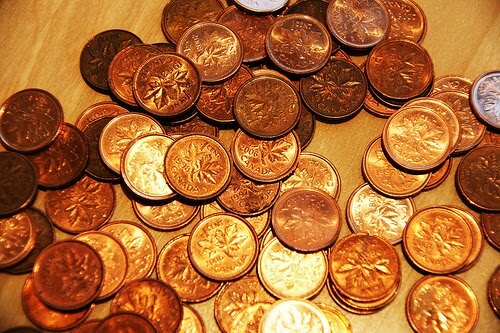 Remember penny candy from when we were kids? No? Well maybe it's been awhile since I loaded up at the confectionary on penny candy. It must be at least a dime by now. What will those discount long-distance companies do? They won't be able to advertise their services anymore for "just pennies a day". Oh my God. How will Wal-Mart be able to roll back their prices? Shoe makers will be in big trouble. They'll have to shelve all their penny loafers. For those that play the market, it'll be more expensive. No more penny stocks. Maybe every time it rains it'll rain quarters from heaven. Somehow bad-boy rapper 50cent just won't sound so bad as 50nickel. And, perhaps, worst of all, I'll just never listen to the Beatles' Penny Lane in the same way! It's been 43 years since Paul McCartney penned that tune. By now it must be at least Dollar Drive. OMG! A Canadian politician was actually thinking?? We should declare a national holiday! Heh heh. I remember penny candy! And when chocolate bars were 10 cents. I owned a variety store not too long ago and we'd sell penny candy, of course some of them were 2 cents, but they are still around, I believe. 00dozo: Ha, ha, yeah, a penny for his thoughts! You're showing you age about the price of candy! The poor, poor penny. It get's little respect down here too. Like dropping one and not worrying about picking it up. Oh, about the Memorial Day mix up? No problem. I didn't know that Canada had a Victoria Day. We're even. Don: It's a monarchy thing, to celebrate the birthday of the Queen at Canada's Confederation. She reigned for 63 years and died in 1901. She's also the ugliest Queen I've ever seen...except for that transvestite I saw one time at a club in Toronto. Happy U.S. Memorial Day, Dufus! Here's to the memory of penny candy! CL: Happy Memorial Day to you ma'am. And, yes, here's to penny candy and all those dentist bills my parents used to pay! I dunno what the fuss is all about. The loonie works and sounds good to me. I think they talked about getting rid of the penny here too and for the same reasons. They didn't and they won't. I think they'd have to change the state tax so that it would always come out at .05 which would only make it go up. I'd sure like to see 50cent add an 's' to the end of his name. Jen: Yeah, that's the problem the price of everything would go up, of course, not down a nickel. By the way, thanks for dropping by. I'm amazed at all you do: run your own blog, create and manage Tribal Blogs, follow all the developments, respond to people and visit the links and leave a comment. I don't know how you do it but you're my internet idol!